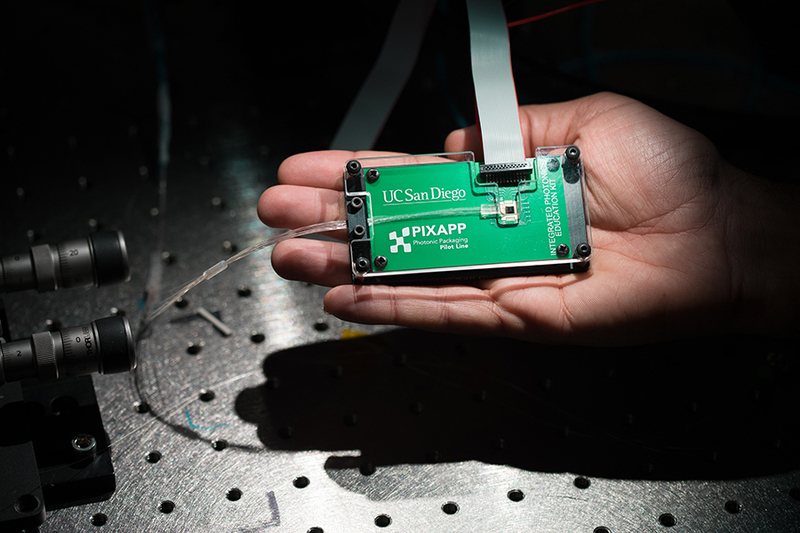 Engineers at the University of California San Diego, in collaboration with Tyndall National Institute in Cork, Ireland, are developing an educational toolkit to bring integrated photonics into the college engineering and science curriculum. 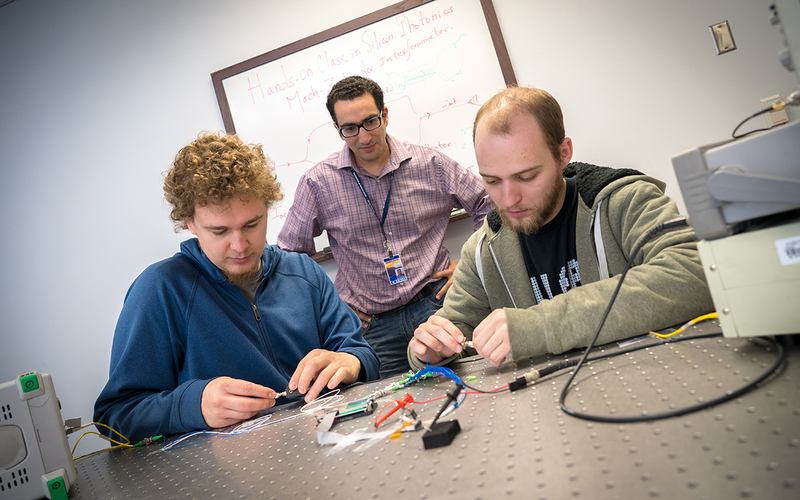 The toolkit, which was developed in the Qualcomm Institute's photonics labs and Nano3 facility, is designed to teach undergraduates practical skills in integrated photonics, including how to characterize and test photonics integrated circuits—skills that today are typically acquired at the PhD level. The team envisions that teaching these skills earlier on will enable more graduates to enter the integrated photonics industry workforce and meet the growing demand for photonics technicians and engineers. The project was conceived by Abdelkrim El Amili, a research scientist in the Department of Electrical and Computer Engineering at UC San Diego. His team includes Shaya Fainman, a professor of electrical and computer engineering at the UC San Diego Jacobs School of Engineering, and Jordan Davis, a PhD student in Fainman’s lab. The UC San Diego team is collaborating with researchers led by Professor Peter O’Brien at Tyndall’s European Packaging Pilot Line PIXAPP. The team presented a prototype of the toolkit at the 2019 Optical Fiber Communications Conference and Exhibition (OFC) held in San Diego in early March. “This toolkit will bridge the gap between the growing demand in the silicon photonics job market and the supply of technicians and engineers who have practical skills in the field,” said El Amili. “As the market grows, there will not be enough graduates to fill all these opportunities because only PhD graduates so far have the practical skills in integrated photonics. But learning integrated circuit design, device fabrication, packaging and testing should not be limited to PhD students. Our hope is that by bringing hands-on integrated photonics training to undergraduate and masters students, this toolkit will equip them with the knowledge and skills to fill new job opportunities,” he said. The toolkit, dubbed Integrated Photonics Education Kit (IPEK), is a packaged silicon photonic platform. Instructors can use it as part of an engineering laboratory course to teach students basic building blocks of photonics integrated circuits. By experimenting and tinkering with the plug and play kit, students can gain experience designing, assembling and testing photonics integrated circuits. The current prototype includes 6 photonic components such as a waveguide, micro-ring resonator, short and long Bragg mirrors, filters, and a Mach-Zehnder interferometer. These are basic building blocks in educational, research, and industrial environments. The devices can be controlled using heaters. Additionally, many of these devices are electrically tunable to demonstrate various modes of operation to the user. They can be also combined together externally using fiber for more complex photonic functionality. Abdelkrim El Amili (center) is leading the IPEK project to teach students practical skills in integrated photonics. IPEK offers many of the functionalities of conventional photonics platforms for a fraction of the cost. It costs around $1,500 to build whereas the equipment for a conventional setup costs around $10,000 to $12,000. And while conventional platforms are bulky and require a separate lab space, IPEK is portable. The current prototype fits in a user’s hand. IPEK is also robust and easy to use, said El Amili. With the plug and play package tool, users no longer need to spend time aligning and stabilizing the optical fiber like they would with a conventional platform. “We gain time in performing the experiment,” he said. The team is working to refine the prototype. El Amili, Davis and Fainman are preparing a laboratory curriculum at the UC San Diego Jacobs School of Engineering to implement the toolkit. For more information on the toolkit, please contact Abdelkrim El Amili at aelamili@eng.ucsd.edu or +1 (619) 432-9014. This work was funded in part by the San Diego Nanotechnology Infrastructure (SDNI) at UC San Diego, a member of the National Nanotechnology Coordinated Infrastructure, which is supported by the National Science Foundation (grant ECCS-1542148).